I suspect Queensryche fans are going to have some difficulty with Dedicated to Chaos, their eleventh studio album. Perhaps some will cringe or simply be perplexed. Likely, cognitive dissonance will set in as they struggle to classify Queensryche's direction. Honestly, my interest ran from curiosity to ambivalence. Call it progressive rock, maybe a little metal, or more alternative heavy prog rock. I'm not sure there's a single theme here. 'Chaos,' in one sense, suggests inherent unpredictability, at least against the norm or status quo. This is not Queensryche of Operation Mindcrime. Tentatively, Dedicated to Chaos is likely not the Queensryche fans know and love. From the start and throughout Dedicated to Chaos is a struggle. Automatically, Get Started, Hot Spot Junkie, Got It Bad can put you off. It's that cognitive dissonance again. But Hot Spot Junkie offers a modern quick beat with a fine guitar solo. And Got It Bad offers a different rock groove, almost a funk feel. Then there's those songs that offer some accessible appeal blurring prog with alt pop feel like Drive or Luvnu. Perhaps Queensryche faithful will feel more comfortable with obvious prog of the alternative Higher, the edgier Retail Therapy, strangely constructed At the Edge. Or again, maybe the fan will be happier with the political and social conscience of The Lie, a taut and heavy rocker, or Big Noize, a moderately paced nearly ethereal piece with great bass work. With little doubt, Dedicated to Chaos will take some patient listening. With Dedicated to Chaos, there's a lot of interest here, and certainly some entertaining, if not challenging, moments. Queensryche seems never to want to stand still. Dedicated to Chaos is Queensryche being themselves: critics and fans be damned. Conversely, given the right push, this disc might resonate with those fuzzy faced denizens of the alt rock scene. More spins required. With Dedicated to Chaos, there's a lot of interest here, and certainly some entertaining, if not challenging, moments. Queensryche seems never to want to stand still. 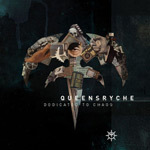 Dedicated to Chaos is Queensryche being themselves: critics and fans be damned.